Over half of physicians report experiencing symptoms of burnout. The topic has garnered much attention not only because of its impact on the healthcare practitioner, but also due to its detriment to the patient. 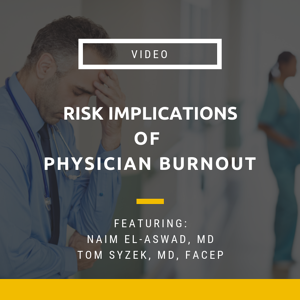 Join Naim El-Aswad and Tom Syzek as they outline the definition of burnout, factors causing it and the risk implications of its presence in your organization. Medical liability issues associated with burnout. 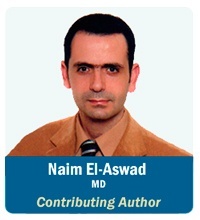 Dr. Naim El-Aswad has been an internist and emergency room physician for over 18 years. He practices in the Houston area. He is the founder and Chief Medical Officer of Vital Signs Vital Skills, a coaching and consulting company that specializes in executive, life, and wellness coaching. Dr. El-Aswad is a national and international speaker, researcher, and educator on physician burnout. He is an expert in the field focusing on the use of emotional intelligence, self-leadership, and self-care in combating burnout. 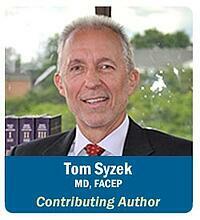 He is the author of the book , Physician Burnout, An Emotionally Malignant Disease, as well as several online and paper publications on burnout among healthcare providers. Dr. El-Aswad has conducted workshops, live and online training modules, and one-on-one interventions targeting physician and nurse’s burnout, healthcare provider leadership, and executive leadership in the healthcare industry. He is currently and adjunct faculty at the University of Houston providing CME education to physician and executive leaders on burnout. He has worked with several clients including The Sullivan Group, McGill University, Methodist Healthcare systems, Memorial Healthcare System, EmCare, Envision, and HCA.